LEXINGTON, Ky. (May 3, 2016) — Today, the University of Kentucky Board of Trustees approved the creation of the new Lewis Honors College at UK. The board approved first reading of revisions to the university’s Governing Regulations that allow establishment of the Honors College. This major educational unit, which will join UK’s existing colleges, The Graduate School, and UK Libraries, will include leadership by a dean and governance by college faculty. UK has had an Honors Program since 1961, currently operating out of the Division of Undergraduate Education in the Office of the Provost. Transitioning the program to an Honors College will help attract top-quality students and improve access for underrepresented students and those from lower socioeconomic backgrounds to educational environments otherwise reserved for students at expensive, private institutions. The proposed Honors College will not offer baccalaureate degrees of its own; rather, the Honors College curriculum and requirements will emphasize interdisciplinary approaches, methodologies, and learning outcomes. Honors College students will all declare majors in other undergraduate colleges, but will have their completion of Honors College requirements acknowledged on their diplomas and transcripts. Faculty governance will be through tenured faculty borrowed from other UK colleges assigned to the Lewis Honors College. The creation of both an Honors College and the living-learning facility where it will be housed was made possible last fall by UK alumnus Thomas W. Lewis and his family, of Paradise Valley, Arizona, who committed to the single-largest gift in UK’s history — $23.5 million to create one of the country’s leading Honors programs. For this reason, the board previously approved the facility to be named in honor of the Lewis family. Lewis Hall is expected to be online by August 2017. “Across the University of Kentucky campus are profound examples of people’s faith in our institution, the work we do and the lives we shape,” President Eli Capilouto said in February when the board approved the development and naming of the facility. “The Lewis family is investing in the University, and their investment will yield an extraordinary academic experience for students in the new Lewis Honors College. We place our students first; so, too, do our donors and alumni who believe those students represent a bright future for Kentucky and the communities they touch." 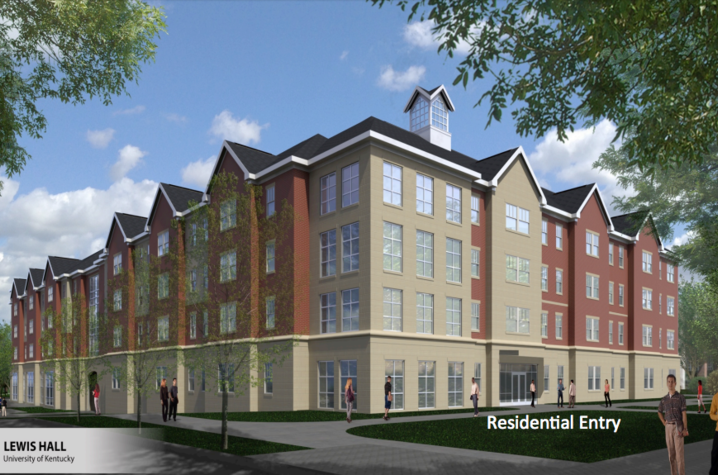 Located at the corner of University and Hilltop Drives, Lewis Hall will be a five-story, 346-bed and LEED-silver certified student housing facility constructed and managed by Education Realty Trust, Inc. (EdR). EdR will invest nearly $27 million toward the total estimated scope of $37 million for project. The T.W. Lewis Foundation and the university will fund the remaining amount for 20,050 square feet of space dedicated to the Lewis Honors College. In the last five years, at the direction of Capilouto and the Board of Trustees, participation in the university's Honors Program has nearly doubled, growing from 750 students to 1,400 — part of an effort to enhance the undergraduate educational experience, while also improving retention and graduation rates.